Mike White talks to Reality TV World in an exclusive interview about Survivor: David vs. Goliath. Angelina Keeley talks to Reality TV World in an exclusive interview about Survivor: David vs. Goliath. Nick Wilson talks to Reality TV World in an exclusive interview about Survivor: David vs. Goliath and his win. Davie Rickenbacker talks to Reality TV World in an exclusive interview about his time on Survivor: David vs. Goliath -- including what he says was Angelina Keeley's biggest flaw in the game, and if he thinks he could have beaten Nick Wilson. Mike White, the runner-up of Survivor: David vs. Goliath, opens up to Reality TV World in an exclusive interview about his time in the game -- including how confident he was walking into the Final Tribal Council that he could win and what changed by the time the session ended. 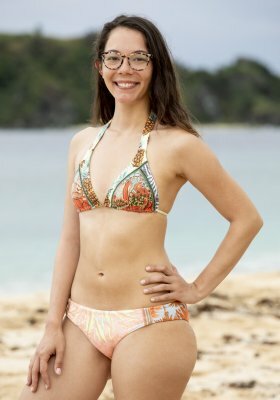 Angelina Keeley talks to Reality TV World in an exclusive interview about her Survivor: David vs. Goliath experience -- including whether she was surprised to not receive a single jury vote and whether she would have voted for Nick Wilson or Mike White to win if she had to cast the tie-breaker at Final Tribal Council. Nick Wilson opens up to Reality TV World in an exclusive interview about Survivor: David vs. Goliath and his victory -- including why he ultimately believes he won the game, whether Mike White's wealth impacted his jury votes, and what surprising comment really humbled him during jury questioning. Survivor: David vs. Goliath named Nick Wilson its winner over runner-up Mike White during Wednesday night's three-hour finale event of Survivor Season 37 on CBS. Christian Hubicki wraps up his exclusive Survivor: David vs. Goliath interview with Reality TV World -- including whether he had planned to play his idol the night Gabby Pascuzzi went home the whole time or it was a last-minute decision based on others' reactions. Christian Hubicki talks to Reality TV World about his Survivor: David vs. Goliath experience -- including whether he would admit to losing focus or edge in the game due to an ongoing desire to protect Gabby Pascuzzi.